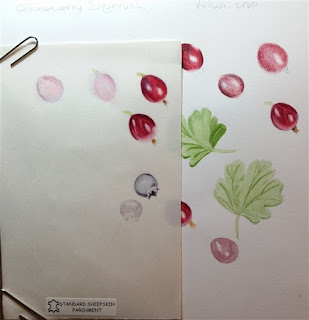 For a while I'd been wanting to try out painting on Vellum and last year, fellow artist and friend Shevaun Doherty gifted me a sample of vellum for me to try. For a year I looked at it, examined it and backed away. what if I spoiled it? what if I wasted it making mistakes and ruined it? In the end, I contacted William Cowley and bought a sample pack suitable for painting on. Still I waited, there was only one piece of each type and I'd never worked on vellum before. More research was needed. 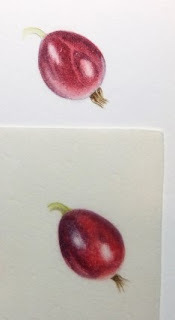 Luckily some of my Botanical Artist friends have blogged online about their Vellum painting techniques, so I was able to read about how they work with this tricky medium. Dianne sutherland - Painting On Vellum who also teaches an online course Dianne Sutherland Botanical Art Online Course - Painting On Vellum, Shevaun Doherty of Botanical Sketches and Other Stories: V is for Vellum, Sarah Morrish of Art and the Hedgerow: Painting on Vellum, and Kate Nessler for her article in The American Society of Botanical Artists: Painting on Vellum, all have excellent articles online about painting on Vellum and I learned an enormous amount from them. Once I had enough information, it was time to practise my technique. I've never been one to practise a piece fully before painting. A few tonal/colour swatches and notes, a trial of a few petals/buds/leaves and I'm off. I've always produced better results when I'm still exploring a subject and there's no point in having my best work in a sketchbook. 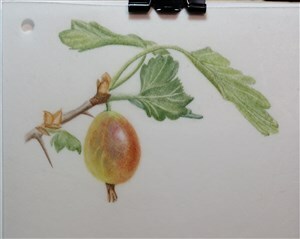 But there's no room for this with Vellum, it's too rare, so practise I did. First practise was on paper, then on a small piece of Sheepskin Parchment which was lovely to work on. Fortunately the gooseberries didn't ripen together so there was a steady supply of berrries. 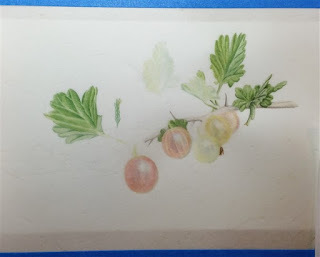 Then, with more confidence, a more ambitious attempt on Manuscript Vellum, I tried a little piece of Kelmscott, but really didn't like working on it. Salvadore Dali was right, there's no danger of me reaching perfection, but I won't stop trying. I'm still not sure how I feel about painting on vellum, but I have a little more, so will try it again when I find the right subject. What do you think, are you tempted to try it? Aww Thank You Shevaun, you and a few others helped with the fear factor - it's a lot easier to try something new when you have such excellent teachers! Thanks Lesley. Do order some samples, you'll be glad you did, and the lnks to other Vellum Artists will help you get to grips with the techniques. Not sure I've got the knack yet, but I'm working on it. Polly, Wonderful results, especially for your first try! 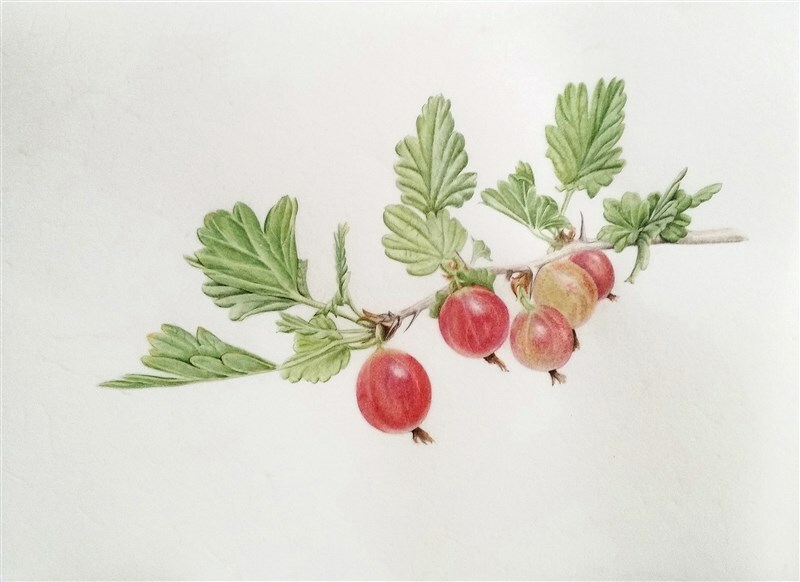 The gooseberries look transparent and juicy, with the beautiful luminous color that you get from vellum. I'd say that you are a natural! Thank You Janene, not sure I'm a natural with vellum, it's almost opposite to the way I normally work, but I've learned a huge amount and I'm sure it will help my work on paper too. Such beautiful work Polly, very impressive. Thank you Vicki. I have such wonderful Artists to inspire me and spur me on - including you. Thank you Claire. I'm looking for the right subject for my next piece, but will take my time. 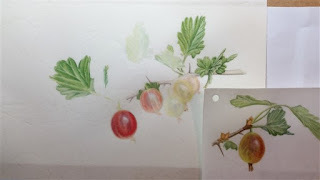 Still waiting to see your next Vellum work - always a real treat. Looking good Polly! It's amazing how it just glows, I'd forgotten the wonder that is vellum. I guess I just had to otherwise it would have become an expensive addiction! I think you've done a marvellous job. I'm currently in conversation with the McEwes trying to get hold of thus letter still about how Rory stretched his works. You've reminded me to pursue.